At Motorcycle Live in November, we unveiled the finished version of the winning design of our Design a Milano Competition. The new colour scheme of our Milano model which was designed by Alex Billingham, features a metallic red body with grey front and sides, complemented by the RAF roundel. As we were exclusively revealing the production model of the new Milano at Motorcycle Live, we invited Alex along to the show to see his design in the flesh. We managed to have a chat with him during the show to find out what he thought of the scooter now that he could see it in living colour. When asked how seeing his design fully produced for the first time made him feel, Alex said: "speechless, its amazing, I love it!" 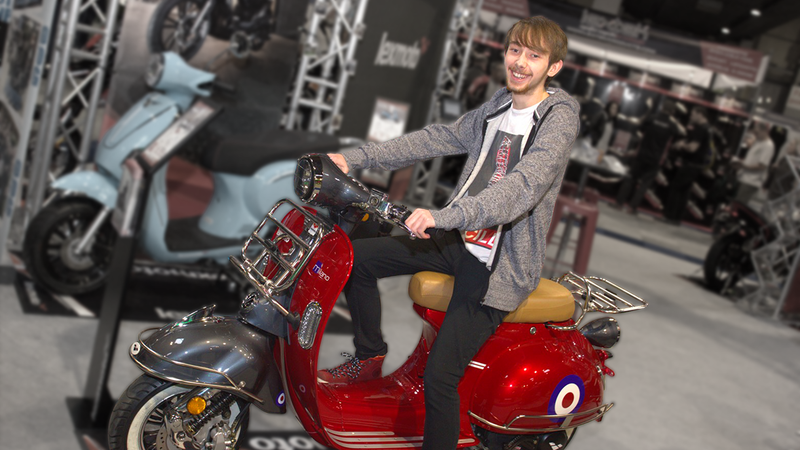 With the initial competition having very few limitations in regards to design, we asked Alex what inspired his red and grey creation, he commented "I realised it looks like an old Vespa so I thought Mods and the RAF roundel"
This competition was a new venture for Lexmoto and we were unsure what the response would be. We were absolutely thrilled by the quantity and quality of the submissions and with so many designs to choose from we wondered how Alex felt when he first found out he had not only won the competition but a brand new bike, to which Alex responded with "I didn't believe it to start off with". The new Milano in his winning colour scheme will soon be making its way to Alex. We will also be making it available to purchase as a limited run from our dealers nationwide. If you want to own the new special edition Milano, contact your nearest dealer to register your interest.